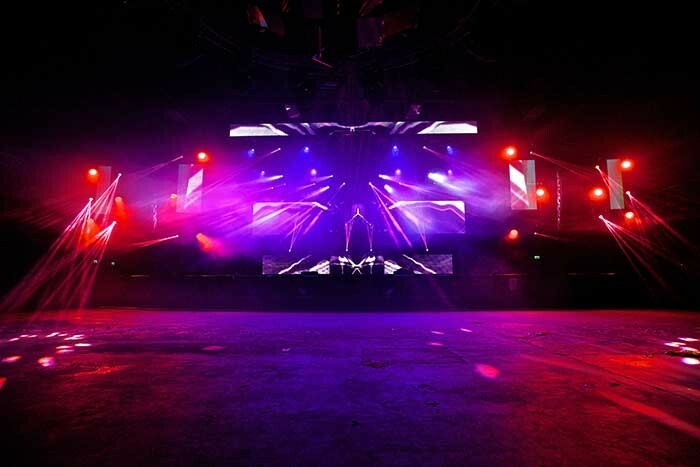 UK – Manchester-based dbn Lighting is once again supplying an integrated lighting and visual design plus equipment – including lighting and LED screens – to one of the most cutting edge EDM experiences in the north west – The Warehouse Project (WHP), which has grown in popularity and cool under the careful curatorship of founders Sacha Lord-Marchionne and Sam Kandel. WHP operates for two regular nights each week from September to New Year’s Eve on a timeline coinciding with the new university and college terms. It attracts all the hottest international EDM DJs and live acts and sells out months in advance. It’s the second year the club is operating out of its new Victoria Warehouse venue in Trafford Park. dbn’s Pete Robinson has been involved with WHP right from the start and this year he created the production and lighting design for all three rooms in the space. In the Main Room he started with a new blank canvass and the intention to make it look totally different from last year from last season. “I wanted to create a high-impact visual environment with a bit of rawness and authenticity in keeping with the whole WHP concept,” he explains. This year there is a strip of dbn’s 12.5mm LED screen 13 metres wide by two metres deep at the back of the stage flanked either side of the PA wings at front truss level by two vertical LED drops at one metre and half a metre wide by two metres deep. 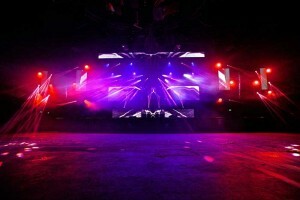 Several panels of LED are mounted on the front truss facing into the audience, and the visual surfaces are completed with a versatile ten metre wide by one metre deep strip of LED – divided into four sections each mounted on wheeled tank traps – which can be placed onstage in different configurations according to the band or DJ set up. dbn supplies all the processing, scaling and switching, while the video content for each week is supplied by a third party and/or the performing artists. The idea is that the LED screen design will work on different perspectives whether you are standing right close up to the stage or right down the far end of the room, there will always be some eye-catching visuals in view. Moving on to lighting, above and below the screen onstage in the Main Room are 32 Showtec 5x5 Matrix Blinders. Each has 25 x 75W tungsten bulbs and a pretty devastating effect! These, together with 24 Active Showtec Sunstrips running along either side of the large dancefloor area, are mapped into an Avolites Pearl Expert Pro console allowing some mind-blowing effects to be created that zap all around the room immersing the audience. Above the stage are three trusses – dbn purchased new OV 300 and 400 trussing from Total Fabrications – installed to give overhead lighting positions, together with another truss flying the LED screen and a sub-hung truss onto which the Matrix Blinders below the screen are rigged. Lighting fixtures onstage include 24 Clay Paky Sharpys, eight Sharpy Washes, eight CP Alpha 1200 HPEs, 12 Robe LEDWash 600s and 17 Atomic strobes, plus a few Strand SLs for key lights and Martin MAC 25O Entours for DJ spots. All of these are also run from the Expert Pro, and floor specials packages for individual artists can be arranged as required. The lighting rig is designed to be as dynamic as possible with plenty of variety. WHP has many regular followers who won’t see the same things each week, and it’s also adaptable for visiting LDs in mind. The stage floor has been left clear of lights to maximise the space for rolling risers and band’s backlines to come on and off quickly and easily. Over the dancefloor lights are rigged onto the house trusses that dbn installed last year. The fixtures are 20 Clay Paky Alpha 575 HPEs, eight Alpha Wash 575s and eight Atomic strobes, all running through the same Avo Pearl Expert Pro. Atmospheric action comes from four DF50 and two ZR44 smoke machines, and dbn supplies a team of operators from dbn, which also ensures variations in style and feel of the lighting week-to-week. Room Two is modelled similar to last year as the look was very successful, but the LED screens are gone and new are 36 Chauvet Nexus 4x4 LED blinder panels behind the DJ booth for serious eye-candy! 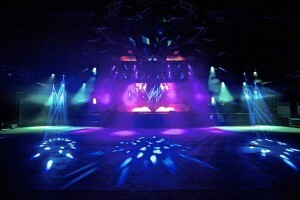 The moving lights are 8 Alpha Wash 575s,14 Alpha 300 HPEs and 12 SGM Genios – a small LED moving light – all run from an Avo Tiger Touch, along with eight Atomic strobes. The Nexus 4x4s are all mapped as a matrix panel for the creation of funky, mesmeric effects and this consumes almost four DMX universes alone! The fixture’s adjustable white balance is very useful for disguising the fact it’s an LED source, especially when dimmed low when the panels take on an understated near-tungsten appearance and link really well with the 28 Showtec Sunstrips also installed in this room. In Room Three dbn has supplied six Martin MAC Entours, four CP Alpha 300 Washes, three Atomics and 12 i-Pix Satellite LED bricks complete with Pearl Tiger control and ZR12 smoke. To illuminate the various bars, chill out areas, merchandise stands and other periphery areas, dbn has located around 120 MR16 birdies together with assorted profiles to project sponsor logos.